Players start in the press-up position. On the coach's call players must get to their feet and run around the course as quickly as possible. 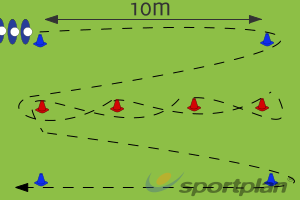 This drill is designed to test your players' ability to run at speed whilst changing direction. You can use a stopwatch to take players' times and see who has the fastest time overall.